Acquired by Sir Cecil Beaton in 1947, when he purchased Reddish House from the artist's parents, Dr. and Mrs Robert Lucius Wood. Anonymous sale; Christie's, London, 9-10 June 1980, lot 469, as 'Battersea Park'. E. Newton, Christopher Wood, London, 1938, p. 69, no. 213. London, Redfern Gallery, New Burlington Galleries, Christopher Wood: Exhibition of Complete Works, March - April 1938, ex-catalogue. London, Redfern Gallery, Christopher Wood, April - May 1959, no. 14. By 1927, when the present work was painted, Wood had met his new friends, Ben and Winifred Nicholson, a duo who would have a profound effect on Wood's work. Wood had returned to England between 1926 and 1928 and his work was shown in London galleries where it attracted positive comments. The English art critic Peter Spencer Churchill wrote in the New Statesman: 'He [Wood] has been influenced greatly by modern French work, but has not been conquered ... The dry winds of the continent have blown away from his canvases some traces of the fog that besets these islands, but they have left a clean colour and gay humour which is essentially English' (23 April 1927). 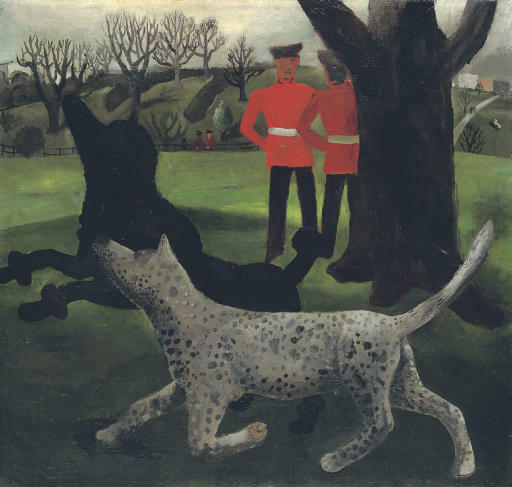 Dogs at Play has an almost surreal quality with the two large dogs bounding across the foreground of the canvas. Wood was heavily addicted to opium during his lifetime and many of his works have a dream-like quality. Eric Newton comments, 'His best paintings are radiant and faintly sinister. Fra Angelico and El Greco seem, for once to have met on common ground. There is an unclouded purity, at times a rapture, in his pictures, but there is also a thunderstorm somewhere in the neighbourhood. Sometimes it is the inky blue-black of the sea, sometimes a leaden sky, more often a series of sinister shapes that cannot be analysed, that set the mood' (see Christopher Wood: His life and work, London, 1959, p. 16).